This swing chair with umbrella lets you fall back in love with your deck or backyard and savour your favourite season(s). Use it to wake up a sleeping garden or to invite tranquility to a busy day. Whether the look of your home is natural, classic or transitional, this swing chair with umbrella will make any necessary adjustment all by itself. Weather-resistant, canopy covered and ergonomic. This wicker patio chair is constructed using UV and weather resistant materials that is low maintenance and easy to care for. The beautiful blended grey resin wicker and padded seat and backrest combines design and comfort, making it easy to create a backyard space you'll love. The seat covers can be removed and is machine washable. Create an intimate backyard space that you and your friends will love by using this patio corner chair to complete your blue sectional sofa set. Meticulously constructed with an aluminum frame and a variegated grey wicker base, UV and weather resistant fabric and materials, makes it easy to care for and a joy to own. 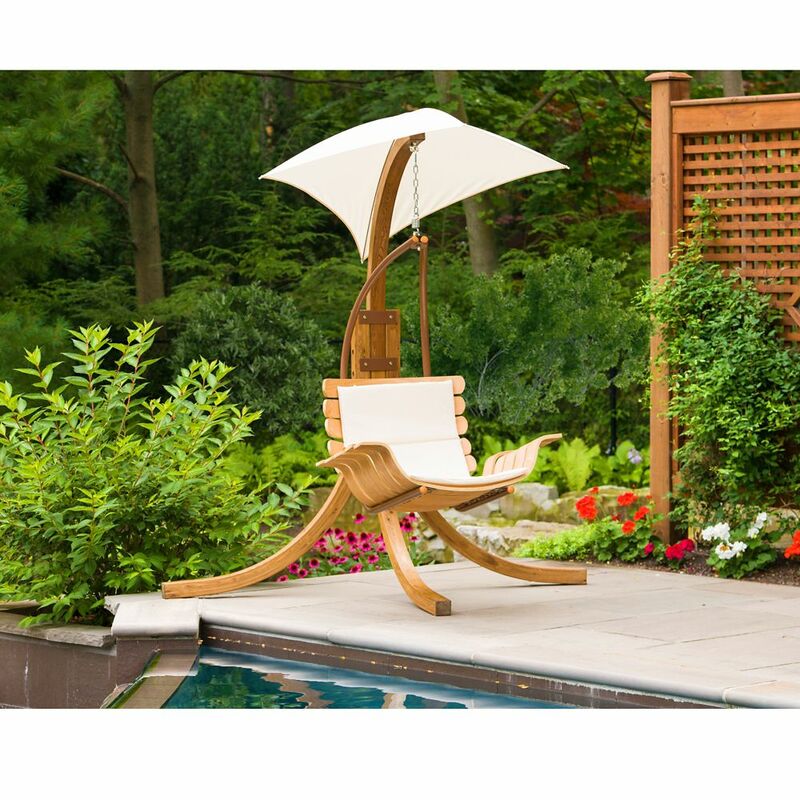 Patio Swing Chair with Umbrella This swing chair with umbrella lets you fall back in love with your deck or backyard and savour your favourite season(s). Use it to wake up a sleeping garden or to invite tranquility to a busy day. Whether the look of your home is natural, classic or transitional, this swing chair with umbrella will make any necessary adjustment all by itself. Weather-resistant, canopy covered and ergonomic. Patio Swing Chair with Umbrella is rated 1.0 out of 5 by 1. Rated 1 out of 5 by donotbuyfrom from Poor quality, no response from manufacturer or HD Within a month of being outdoors the chair boards delaminated, and went moldy. The legs went moldy, not enough varnish to protect the wood. Chair was on a deck not on the ground. Didn't last a month outside. Has a one year manufacture warranty. We sent pictures to leisure twice and called home depot 4 times. No return calls or explanation. Do not buy. Home Depot will not warranty or stop selling this inferior product. Leisure Season will not respond to emails nor phone calls from Home Depot.